Our Residential services include repairing locks, replacing locks, installing deadbolts, and all locking devices on windows, crawl spaces, cabinets, garages, and garage remotes. AS&L is committed to providing homeowners a safe, secure and worry free refuge. Whether your family is at home or away, we can make a safe and secure home. Every since September 11th the world has changed its views on how security and safety procedures should be followed. It has made many families ask themselves, "are we really safe and secure"? The security team at AS&L can help in determining that. We can come out and conduct an on-site inspection or simply send you an inspection form with a list of items for you to inspect and check off. Do you have an Ariel light or flood lights around your home? 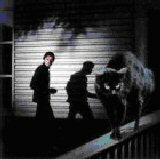 If the home has proper lighting, do the lights have motion detection on them? Does your home have high shrubs or bushes? Does your home have sufficient locks on your windows? Does your home have deadbolts on all exterior doors? Is your homes exterior doors solid core or metal? Do the locks on the doors latch and lock properly? Are there any crawl spaces or cellar doors without locking devices? Does your home have a Safe for valuables and documents? We have a solution for all of the above and more. It is very hard to put a price on the safety and protection of your family and property. Call us today to either set up an appointment or send you a form for your security walk through. ...and how to stop them. They break through a cellar or back door...With the proper deadbolts you can make it harder! They wrench off the lock....Install grade 2 or 1 deadbolts and knob locks! They pick the lock......Install pick resistant locks! They kick in the door..Reinforce your strike plates on the latching jam side! They drill the lock...Drill resistant cylinders with harden roll pins! They hammer the lock...Install grade 2 or 1 deadbolts and knob locks! They pry with a crowbar...Reinforce jams and strike plates on latch side! 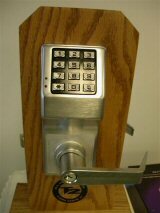 They break glass and reach inside to unlock the door...Install grade 2 or 1 double cylinder deadbolts! Windows, cabinets, craw spaces locks and much more..
A helpful hint when calling us to re-key your home, count the number of places that you can insert a key (these are called cylinders). We charge a service call plus a fee per cylinder to re-key your home. The first 2 keys are free! Do you need a deadbolt installed or replaced? We need to know if it is a metal or wooden door and if there are holes already there for the deadbolt. There is a charge to drill the holes and install. The cost of the deadbolt is dependent upon the one you choose. Note : Locksets purchased at hardware stores or large home improvement stores are invariably inferior in quality to the locks we sell. In order to meet the stringent price constrains and discounting requirements set forth by big retail chains, manufacturers try to cut cost by compromising on quality of the locks supplied to them. And given our unflinching commitment to standing behind our product, we cannot install locks that are not sold by us. 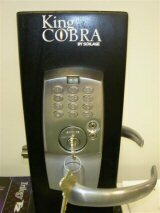 ask us for a High Security Lock system today!